I love hosting events. It makes my heart oh-so-happy! I unashamedly adore my friends and family, rather like a giant Labrador retriever. Admittedly, I should probably dial it back a notch, but that’s not going to happen any time soon. What I don’t really love is stressing out when I have friends over. Hosting should be effortless and enjoyable for everyone, because the focus is fellowship. Sometimes, it’s easy to get caught up in trying to be Pinterest fabulous, but that’s not really the point of welcoming people over to our homes. I find my most enjoyable events are when I keep things simple and my focus on my guests. Needless to say, I’m always on the search for effortless appetizers or hors d’oeuvres recipes. I make my own and experiments with others, always with the thought: how easy would this be to throw together for my guests? Admittedly, wine is usually my main course. Everything is better with wine, I’m pretty much 100% sure of this truth. Wednesday Wine About It is an awesome weekly girls night that I host (inspired by the hilarious Matt Bellassai, who is prob my spirit animal), and it goes without saying that wine or champy is the main course. Hors d’oeuvres are just a secondary but very necessary addition to the night. 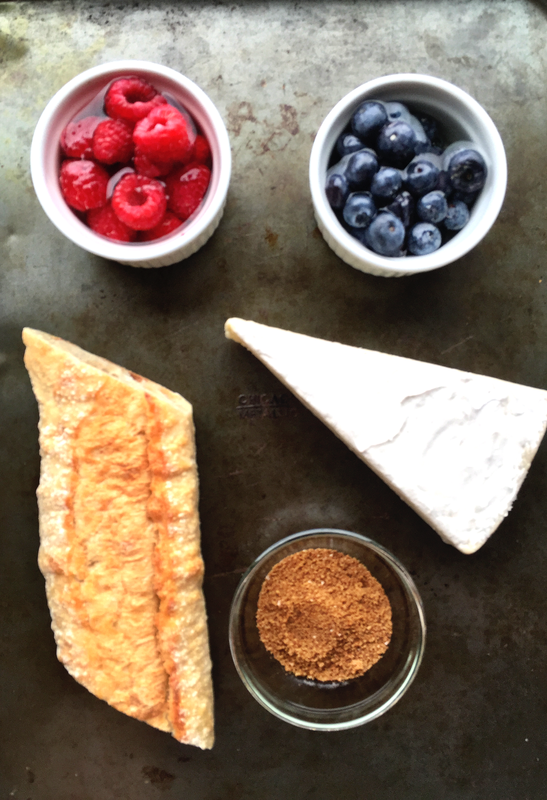 I recently experimented with this delicious brie cheese recipe, and the girls and I really loved it. Maybe the champy made us love it more than we would have otherwise, but we all gave it a thumbs up. What’s nice about this twist on a traditional cheese board is you can also serve it with crackers, fruits and other cheeses if you’re serving a larger group. Brie cheese + berries tastes scrumptious, and the cheese also pairs well with a nice champagne or heavier white wine like a Sauvignon Blanc or a Chardonnay. I never say no to any wine. This is a circle of trust…it’s ok to admit that, right? Right??? Please tell me I’m not the only semi-lush out there! Ok, now on to the recipe! Heat oven to 400 degrees. Slice baguette into about 24 thin slices; line on cookie sheet and lightly spray with olive oil. Drain berries; in an oven-safe bowl, place block of brie cheese + berries, and place both the bowl of brie and baguette slices in the oven about for 3-4 minutes. 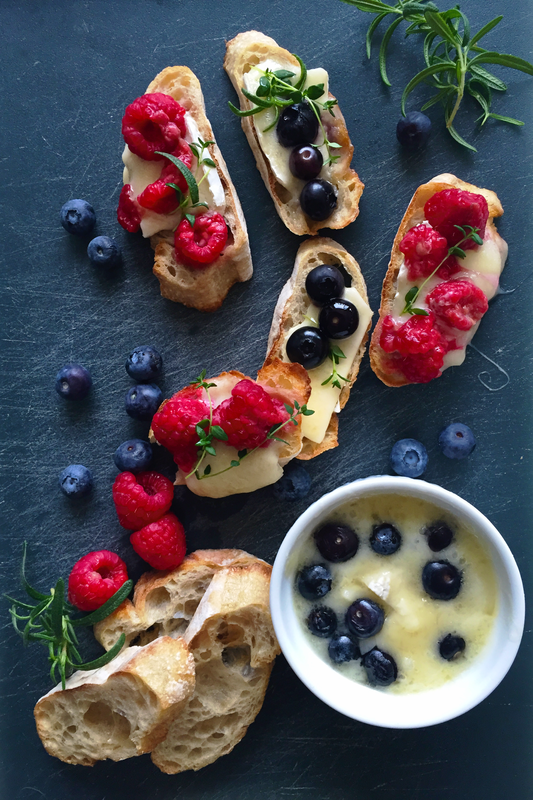 Pull out bowl of brie and baguette slices and dress slices with brie cheese + berries. Place baguette slices back in oven for an additional 1-2 mintues. Remove and dress with fresh herbs. Place on cheese tray with crackers and fruit. Serve with wine or champagne for hassle-free hors d’oeuvres. With simple recipes like this, you can keep your focus on hosting, and not have to worry about putting together the world’s most spectacularly complex ordeal. And since you’re hosting…no one will blame you if you have an extra glass of wine while you’re getting these crostinis ready. I certainly won’t! Have a wonderful week and much love to you! Disclaimer: these are affiliate links that I truly recommend. Treat yo’self!